Getting started- clamping to the hoop. The USC Trojans blew out the UCLA Bruins (again), colorful decorations are adorning the local streets and malls and a man in a vest has been seen roaming the west coast arenas … it must be hoops season!!! Having worked for 4 years with John McDonough, one of the pioneers of the glass remote (and the man in the vest), I've had the pleasure (or was it pain?) of setting a few of these up in my time. Hopefully this will save you a few headaches should you decide to try and get that high-flying dunk shot from behind the glass. - 35mm: I've seen everything from a fish eye to a 35mm used for this. - Hassy: 40mm should do the trick. One Magic Arm with camera plate and Super Clamp/Mafer Clamp. - Make sure you have the Magic Arm with the tightening knob and not the tightening lever. - 8/ 2 (18 gauge/ 2 wire) zip/lamp cord. (Most hardware stores or electrical stores will carry this). - Enough to cover your wiring needs. - Male, female household plugs and add-a-tap connectors. One 8 or 10 foot ladder. Before you leave for the arena, there are a few things you can do in advance to insure a good remote day. Make sure all your cables are in good working order. Test fire them from a distance greater than what you will be needing at the game using the same radio or hardwire set-up. Get the camera attached to the Magic Arm. You can also make your gobo (to eliminate the reflections in the glass) ahead of time and reduce the amount of time you'll have to spend on the ladder fumbling with foil and tape. Cut a triangular piece of black foil that is roughly 8" -10" on each side. You can either use it as is, or you can place strips of black tape on the foil to give it a little more rigidity and durability to last a whole season. Try not to make it too big, as you want your remote to be as "invisible" as possible. Once you have all the proper gear, the first thing you should do when you get to the arena is to verify that you have permission and find out what the team/arena/TV policy is regarding glass remotes. 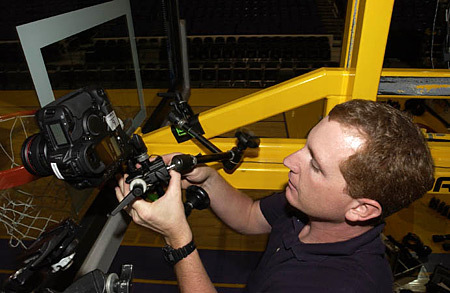 There are very few written rules and regulations regarding the usage and mounting of a remote camera behind the backboard. Each team and/or arena and/or TV may have a different policy regarding this and it is pertinent you know this information in advance. By keeping the safety of the players in mind and using good common sense, you'll be on the right track. Once you have permission, let the fun begin! If this is your first time or your 100th time doing a glass remote, get to the arena at least 3 hours before game time. I know this may seem like a lot of time, but it is always better to have more time than not enough. Plus, it is very difficult to set up a remote during warm ups…trust me. Balls are bouncing around and players are usually standing right where you want to put your ladder and there are other photographers and arena personnel fighting for the only ladder the arena has. So get there early. Assemble your camera and Magic Arm while you're on the ground. This may sound elementary, but a little common sense will go a long way. A 10' fall for a camera (or you) is not a healthy way to start your game day. Tighten the screw on the bottom using pliers to keep the camera from slipping/rotating during the game. But don't over tighten the screw unless you want to strip it. Check all your camera settings. Set your exposure manually. If you're use a handheld meter, take your meter reading pointing up toward the basket from the center of the key and don't forget to compensate for shooting through the glass (approximately 1/4 to 1/2 stop). Set camera and lens on MANUAL focus. Bring out the ladder and check the backboard for a secure place to clamp your magic arm to. Usually the center pole or one of the arms holding the backboard will do. 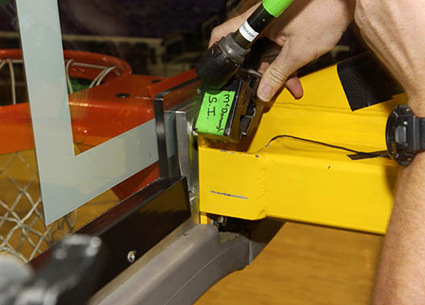 In some instances, you can clamp it to the edge of the backboard, as long as the padding is on the outside of the clamp to protect the players. No part of your camera or magic arm may protrude beyond the edge of the backboard where it may interfere with the game. Once you have found a secure spot, bring up the camera and safety cables and proceed to clamp and secure your camera in place. Your camera should be secure enough to withstand a Shaq monster dunk or an inadvertent ball coming on the wrong side of the backboard. In the event that your camera does come loose, your safety cables should keep the camera from falling to the ground, but they should also be secure enough to keep your camera AND your magic arm from dangling (hence the two safety cables) from the backboard. You don't want play stopped because you have to remove your camera. Composition is always a personal thing. You have to think about what you want the end result to be. Who are you shooting? Vince Carter or Lisa Leslie? Are you looking for a great dunk? Rebound? Finger roll? Are you shooting one player or the whole game in general? Do your homework in advance. Unfortunately these days, you usually don't have a choice as to which side of the basket you can put the camera on cause usually TV will have one side reserved already. Once everything is in place and you have your picture composed, the next question is, "Where do I focus?" Well, again, you have to think about your end result and who you are shooting. But in general, you need to figure out where the ball and your players' heads are going to be at peak action and consider maximizing your depth of field (the area that will appear in focus) by using your hyper focal distance. The hyper focal distance is loosely defined as the focus point located one-third of the way into your picture between your near focus point and far focus point at a given f-stop. This will maximize your depth of field. For men's hoops I personally like to focus roughly 18" below the rim and a foot from the rim at a 45-degree angle from the backboard on the same side of the basket the remote camera is on. Carefully tape down your focus ring. Legendary assistant Shawn Cullen puts the finishing touches on a glass remote. Now that you have composed and focused your camera, you notice the baseline lettering reflecting in the glass. "Dammit! ", you say. Well, this is where that gobo you already made at home comes in handy. First off, lay a strip of black tape along the inside of the backboard along the edge to cover up the chrome. This will increase your contrast by eliminating any light reflecting off the chrome into the glass. Next, take your pre-made gobo and tape one edge to the black tape you just laid across the inside base of the backboard. 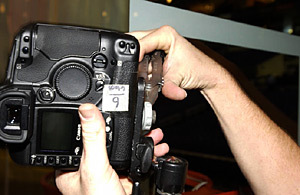 Take the other end (pointed end) and tape it to the bottom of the camera or lens. Voila! The baseline reflection should be gone. If not, add tape to the gobo as needed. 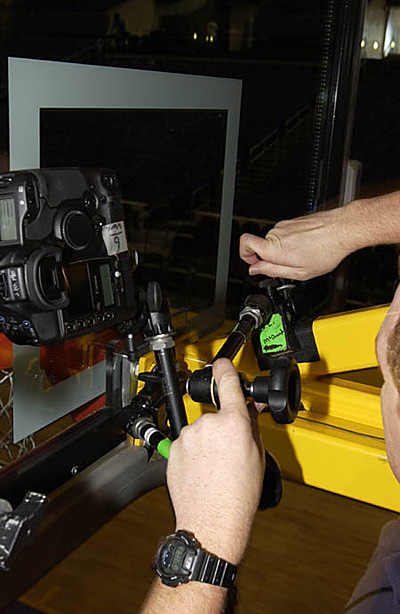 If your camera is higher on the backboard and it is unfeasible to tape your gobo to the bottom of the backboard, then you can tape it to the glass, but instead of using the black tape, use the scotch tape. Black tape will leave a visible white line (from the adhesive) on the players' side of the backboard and will most likely not be allowed. Now attach your remote cable (and sync cable if using strobes). If you're hardwiring, run your wires to the appropriate places (remote trigger to shooting position, PC to sync line). If you're using a radio, I recommend you place your receiver somewhere you can reach it during the game in the event of a problem. The back if the standard is a good place. 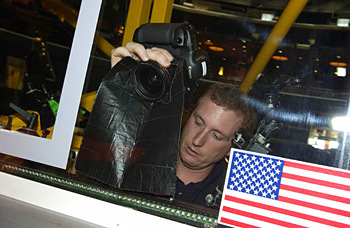 Now that everything is set, tape everything in place and double check your camera settings. Test fire everything from your shooting position. If all goes well, you're remote is all set up and you're good to go. And hush, don't forget to load the camera. This is a lot of work to get no pictures. You can also reload the camera at halftime. Now go set up your other cameras, have a stale hot dog and flat diet coke and read up on the game notes and prepare for the game. Shawn Cullen takes the pre-made gobo and tapes one edge to the black tape he just laid across the inside base of the backboard. The one thing about a glass remote is that it's a crap shoot. You never really know what to expect. One game you may get nothing, but the next you may get the next cover for SI. So if you don't get something the first time, have patience and keep trying. Using black tape, cover up any chrome or white lettering on the front of the camera that may be deemed "distracting" to a player, coach or official. Do not place your camera within the square box marked on the glass. Usually someone from the arena will come and clean the glass, but you may also want to be prepared with glass cleaner or lens cleaning solution and tissue. And make sure they didn't accidentally spray your camera and lens - they do clean both sides. Get permission first. Talk to your local media contacts, team photographer and TV personnel. Get there early. Be prepared. Most accidents or brain farts happen when you're in a hurry. And always remember - safety, safety, safety! Any screw up can cause injury or have an adverse affect on you and your colleagues future working conditions. Be smart. Use common sense. And last, but not least, have fun! Happy shooting!! !